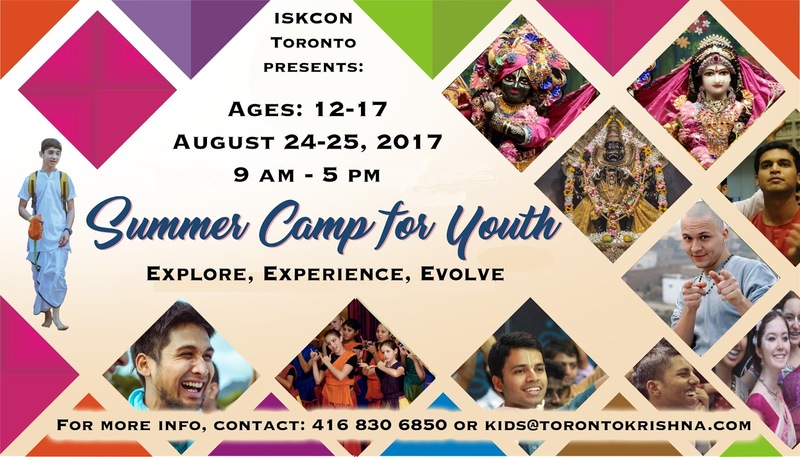 Krishna FunSkool Presents: Summer Camp for Youth - August 24-25, 2017 ~ The Toronto Hare Krishna Temple! Krishna's Funskool at Toronto's Hare Krishna Temple is very happy to announce the Summer Camp for Youth-2017, a unique value-based leadership program for youth aged 12-17 years! Join us for 2 fun-filled days of interactive spiritual learning, intriguing outdoor and indoor activities, sumptuous prasadam, practical life management skills, yoga, meditation, music and much more. We invite you to experience, explore and evolve - discover your true potential. The camp will run for two days Thursday, August 24th and Friday, August 25th from 9:00 am to 5:00 pm. Please register by filling up the form here. 1. In Person - On Sundays at Krishna's Funskool, Govinda's Restaurant, ISKCON Toronto between 6:15 - 7:30 p.m. Please give the name of your child, age and Summer Camp for Youth 2017 while making the donation. 2. Online using PayPal/interac/EMT via donate@torontokrishna.com - Please add the name of your child, age and Summer Camp for Youth 2017 in the description line. For more information please contact kids@torontokrishna.com.